KEXP-FM is a listener-supported radio station in Seattle specializing in alternative and independent music. People (including me) listen to the station from all over the world and, recently, they launched their application for the iPhone. One thing I really love about it is the ability to create playlists and add songs to favorites. These features create a unique experience not available while streaming from the KEXP.org site. Despite the great new features, the relationship with iTunes is familiar and frustrating. Similar to other iPhone music apps including Wilco's, clicking on 'Buy on iTunes' from the Song Info screen abruptly ends the stream and takes the user to iTunes providing no clear way to return to the stream. 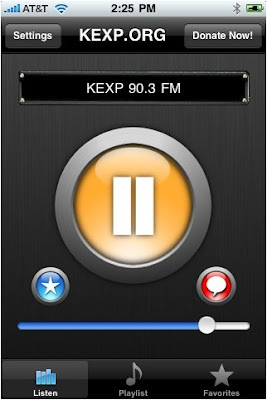 The inability to 'multitask' on the iPhone may discourage users from clicking the iTunes link knowing that their stream will end and they'll have to manually re-open the KEXP app. imploring Apple to modify iTunes so users can always return back to the app they were just using (not likely). Changes like these would make me and Wilco happy.